Just in case you were looking for something to give to your kids to play, you should know that Dracula: Love Kills isn't what you are looking for. If the title didn't tell you that, then the very first image you see in the game will. As for the gameplay, the game is very good. You play Dracula in this game. You set to fight for your right to rule in the world of the vampires, which is also our world. You have an ugly helper named Igor (he reminds looks a lot like Quazimodo) and a beloved (and she looks like Kira Knightley). You also have a magic book that you are going to use to achieve your goal. And all of that is just abundant with sorcery and some form of satanism as for me. 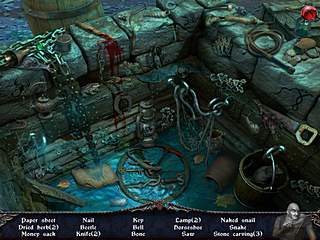 Vampires is one of the popular themes for the games of this genre. That is not new. But in this game things look so too far. That is not a Harry Potter kind of magic any more. It is too bloody, dark and freaky. As for the gameplay, the game is very good. 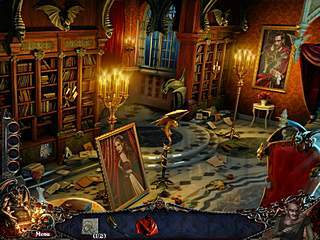 There are some hidden object levels, where you search for the listed items. Every once in a while you come across a mini-game to play. They are just all kinds of puzzles. All that is surrounded by adventure quest, where you go back and forth to collect things and use them somewhere else. One thing that I noticed is that all of the parts of the game are pretty balanced. The lasks are not too challenging and also not too easy. You can adjust that by choosing a mode. The graphics and sounds are just perfect except they are way too creepy. The game would be perfect if it weren't for the darkness and ugliness of the events of the story. You can play levels until you get to the infected Helsing office. Then you will be stuck, cause Dracula can't feed with the bottle of blood on the table. Very disappointing !!!! All you can do next is to DELETE game. I really like this game. Once you played it, you can start over again and make different choices. Nice! This is Dracula: Love Kills review. Download this game here.